I was getting a headcount of all four of our kids, preparing to take the “stay-at-home” reigns, when Charity stepped out the door on her way to work and casually said over her shoulder, “Oh yeah, Remy just ate the last of the baby food. Not sure what you are going to do for lunch. Bye.” The door closed. When it comes to childcare, if Charity doesn’t know what to do then I really don’t know what to do. I scoured the cabinets in search of an overlooked, tiny tub of pureed something. She was right. The only option to feed Remy, my 8 month old, was to pack all the children into the van and drive to the store. Three weeks into being a part-time stay-at-home dad I had managed to not leave the house. 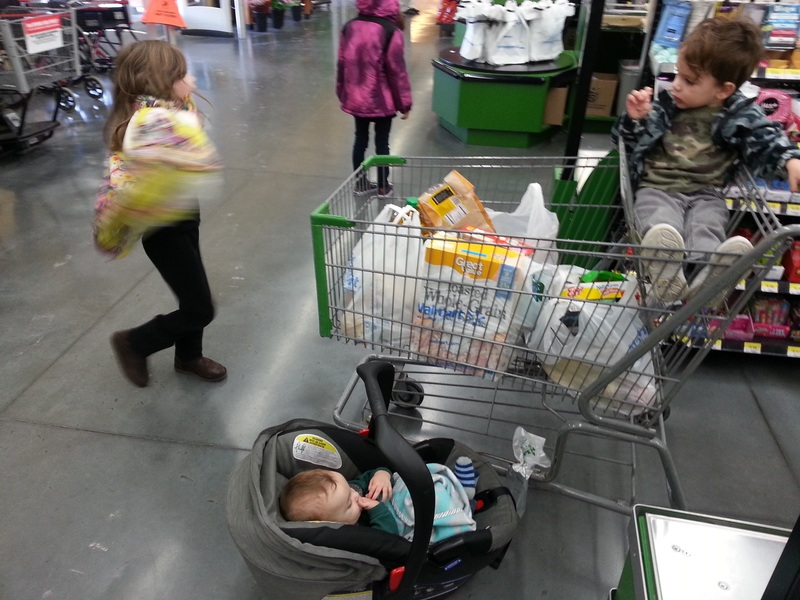 This would be the first time, I think ever, that I would take all four children to the store by my lonesome. But the kid has to eat, right? Right? I mean if he doesn’t somebody please let me know. That would really simplify things. So at 8:45 a.m. I got to work on my new math problem. According to the schedule Charity made me, which I had carved into a marble slab not unlike the ten commandments, Remy takes a nap at 9:30 a.m. and will sleep for maybe an hour and a half. He gets a bottle at 11:00 and we all eat lunch between 11:30 or 12:00. Basically my window for relocating a giant pile of children to the grocery store and then back, before hunger melts them down in public space, was very slim. During Remy’s nap I made sure everyone was ready to leave the house. They were clothed, socked, and shoed. I had a coach’s whistle and a stopwatch as we ran drills loading and unloading the van. They took written tests on grocery store protocol—Roman(2) answered every question with “Rescue Bots”. They did wind sprints and pushed the van uphill while I stood on top of it like a flippin’ Conquistador. One montage sequence later and we were ready. After Remy’s post-nap bottle we hit it. We unloaded at the store and stepped into the parking lot. One thirty-three year old male, four living beings in his care, three that walk, one that might walk into traffic, all stampeding toward the relative safety of brick and mortar. As my eyes darted back and forth between all four kids and the multiple vectors of a dozen moving vehicles, a grandma-type lady passed us on her way out. She looked up, smiled and shook her head. “Well aren’t you a brave soul,” she said. You know what Grandma-lady, I am a brave soul. Often it’s not the hero that chooses the journey, but the journey that chooses the hero. Lack of baby food had chosen me that morning, and I marched down its path. Grandma-lady got me. If six humans standing in the middle of the road would not have been dangerous I would have hugged her right there, and maybe stained her shoulder with a couple tears. With empathy-boosted confidence we walked through the sliding doors to confront a new problem. How do I contain everyone? Nola and Violet are fine. Really, how do I contain the “loose cannon”? I plopped the car seat in the basket and hefted Roman into the cart’s child seat. 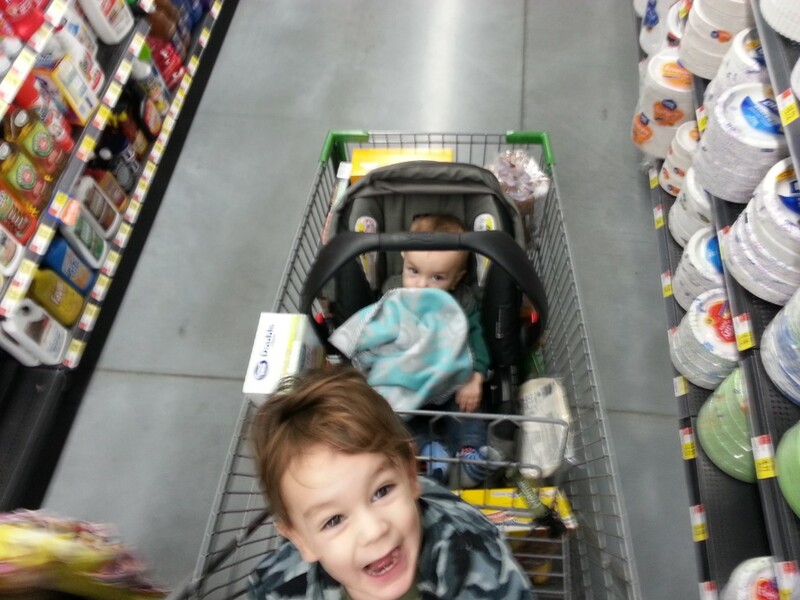 The boys were confined but there was very little room for groceries. Oh well, priorities. We zipped around the aisles and made it through the self-checkout without setting off any “Please Wait For Assistance You Impatient, Hasty Moron” alerts. And now I had a new problem. Where do I put the bagged groceries? I decided to take Remy and car seat out of the basket. I figured I could come back and get Remy, like later in the week or something. I herded everyone back to our van. While we had made decent time, in order to avoid civil unrest, I felt it important that we swing through Runza. I never feel more like a loser than when I leave the grocery store and pull into a drive-thru. But that day I felt like a winner, or a Conquistador if you will. And this, my friend, is why mothers pay the premium bucks to shop at grocery stores that deliver. Brother, you nailed it. How was the checkout aisle? Did you end up spending half your budget on tic tacks and candy with toys on top? I have actually started waking up at 5 or 6am so that I can grocery shop without kids before Jason goes to work. True story. That’s brilliant. Wait…that’s awful. But also brilliant.